The 14th Kunzig Shamar Rinpoche, Mipham Chokyi Lodro. After Karmapa, Kunzig Shamar Rinpoche is the highest teacher in the Karma Kagyu lineage. The reincarnations of the Shamarpas go back to the 13th century. The 14th Shamarpa Mipham Chokyi Lodro was born in Derge, Tibet, in 1952. He was educated by the 16th Gyalwa Karmapa who transmitted to him the complete teachings of the Kagyu tradition. Since the 16th Karmapa’s death in 1981, Kunzig Shamar Rinpoche has devoted his efforts to the many projects initiated by the late 16th Karmapa. He has completed the reprinting of the “Tengyur” a body of two hundred and fourteen volumes in which prominent Indian and Tibetan masters elucidate the teachings given by the historical Buddha Shakyamuni. Shamar Rinpoche also supported and offered guidance to Rumtek Monastery, the seat of H. H. the sixteenth Karmapa. He co-founded and brought into being the Karmapa International Buddhist Institute, New Delhi, India. The Institute currently offers courses in Buddhist studies for both monastic and lay students. 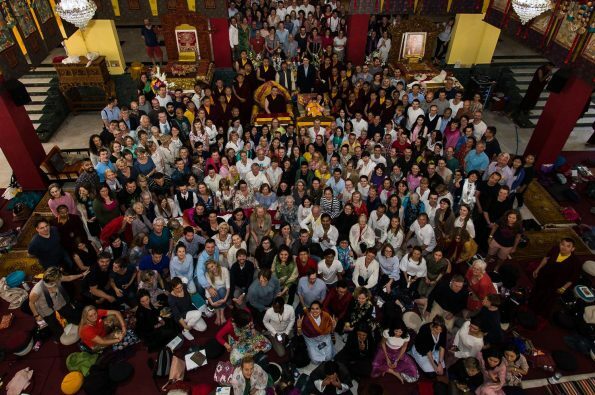 Shamar Rinpoche frequently traveled abroad where he taught at the many Kagyu centers world-wide. He also established an institute for higher Buddhist studies and a retreat center Shar Minub in Nepal, as well as a number of Buddhist centers world-wide. 14th Kunzig Shamar Rinpoche passed away on June 11th 2014. Currently, Thaye Dorje, the 17th Gyalwa Karmapa has the responsibility to recognize 15th incarnation of Shamarpa.